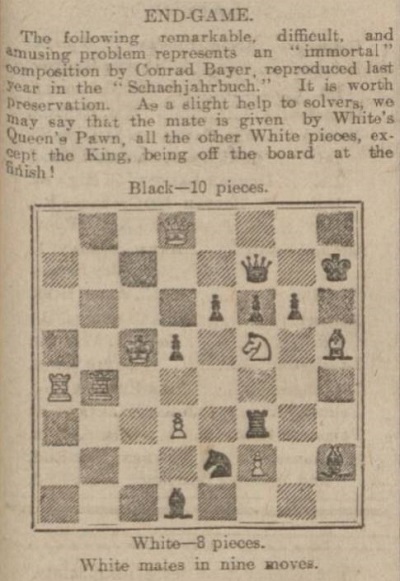 The Bystander, 19 August 1936, page 314. 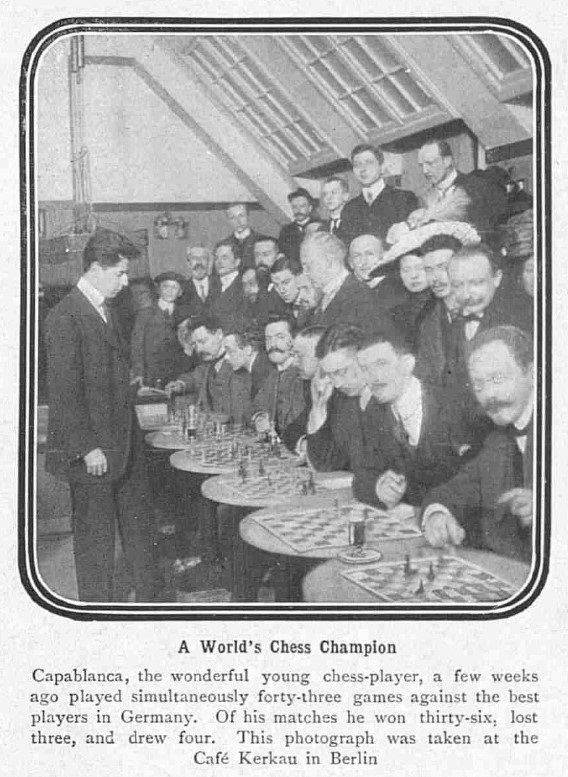 Caption information is not always reliable, of course. 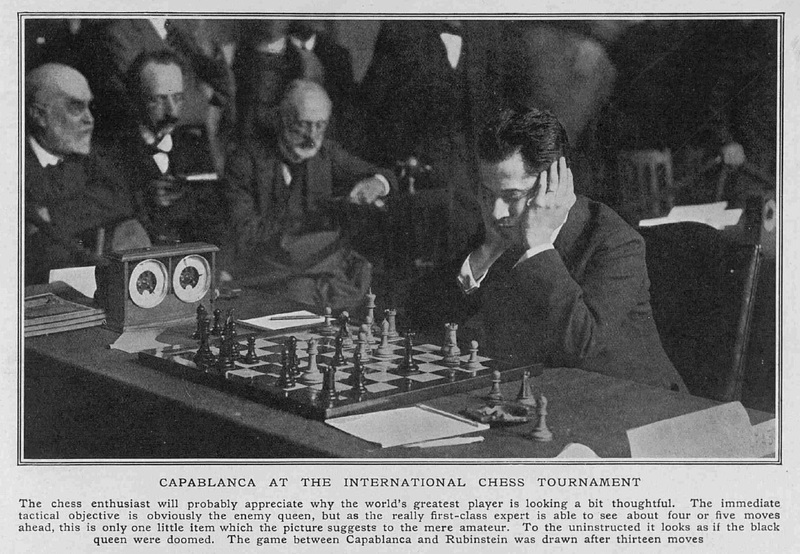 For example, Mr Killoran notes that in the London, 1922 photograph Capablanca was playing not Rubinstein but Vidmar, and was reflecting on his reply to 14...Qb4. 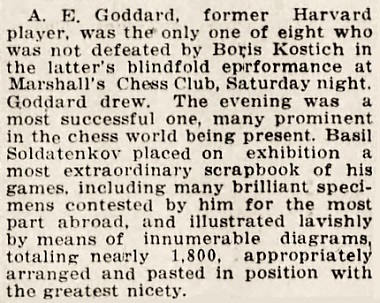 Two correspondents have recently submitted material on Vassily/Basil Soldatenkov, and for ease of reference we have first of all brought together C.N.s 6138 and 6144 in a feature article about him. 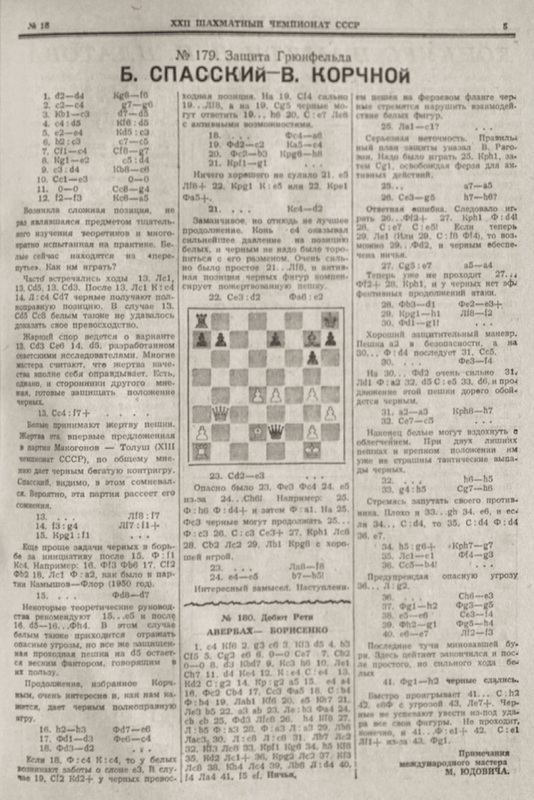 Soldatenkov also has a bearing on the origins of the Marshall Gambit in the Ruy López. 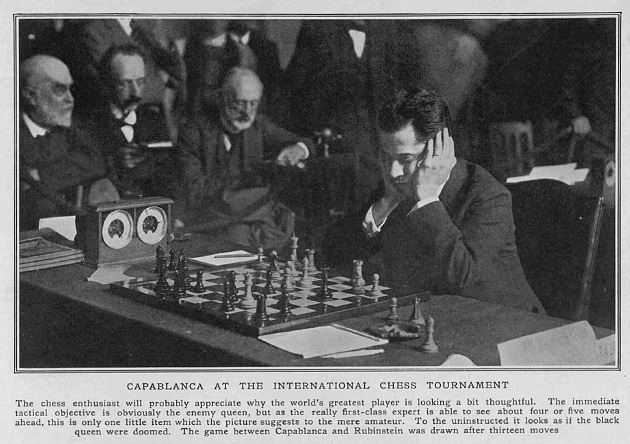 At New York, 1918 Marshall played 8...d5 twice, against Capablanca and Morrison. 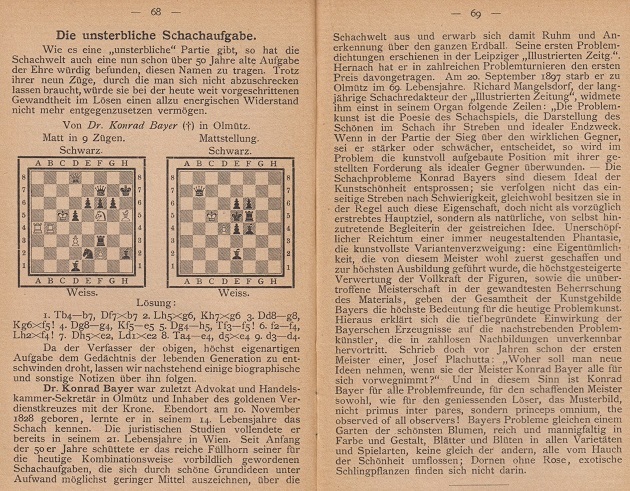 Regarding the latter game it was pointed out on page 276 of the December 1918 American Chess Bulletin (under the heading ‘Duplication of Game after 17 Years’) and on page 21 of the tournament book that a game Sittenfeld v Soldatenkov, Paris, 1901 had followed Morrison v Marshall as far as move 18 (when Soldatenkov played ...Bd6 instead of ...gxf6). 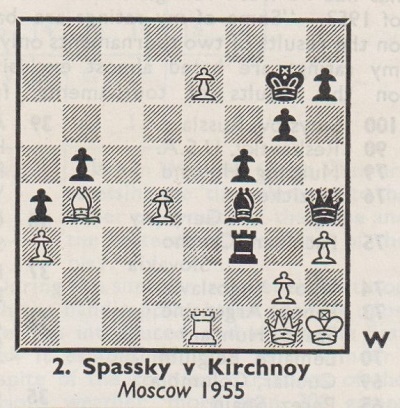 Whereas Marshall’s victory took 84 moves, Soldatenkov won in 25. 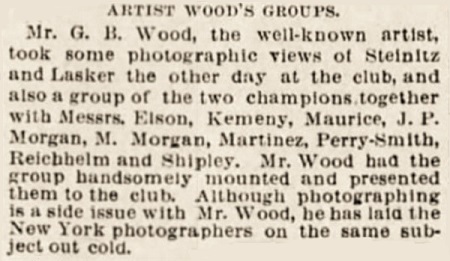 Mr Gillam also draws attention to a photograph (Le Mans, 1913) at the Gallica website. 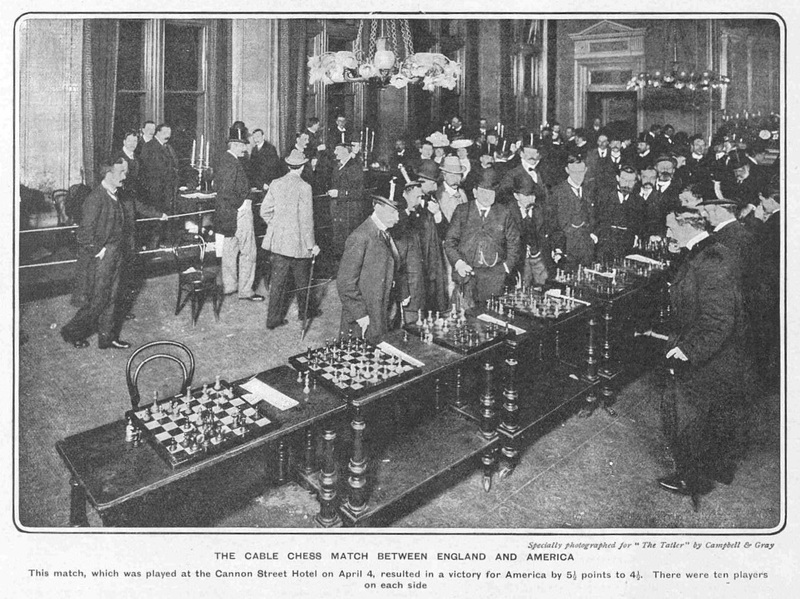 The New York Times (15 October 1917, page 16) reported that a Marshall/Soldatenkov v Janowsky/Jaffe consultation game had just begun (‘The contest will probably extend over the greater part of the week. 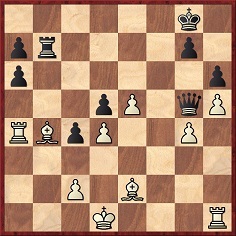 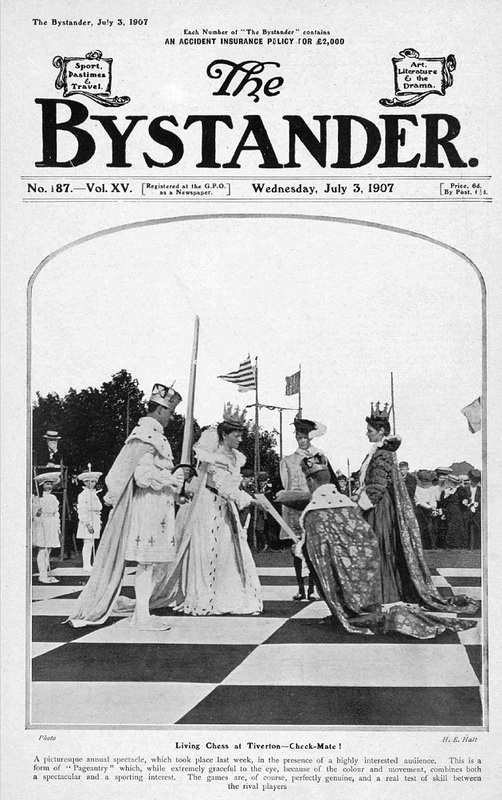 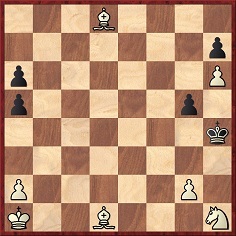 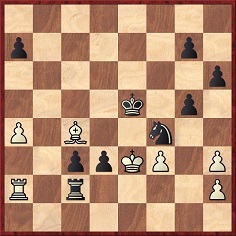 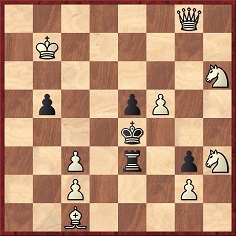 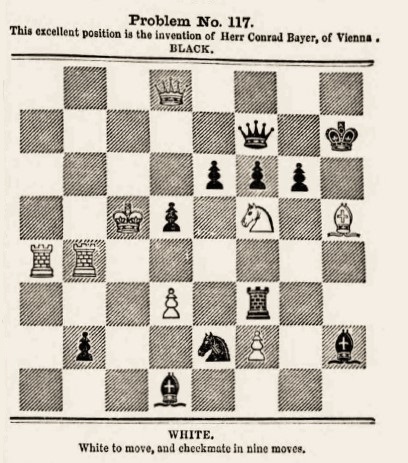 Marshall and Soldatenkov, playing the white pieces, elected a queen’s pawn opening, to which the rival pair replied with knight to king’s bishop third.’). 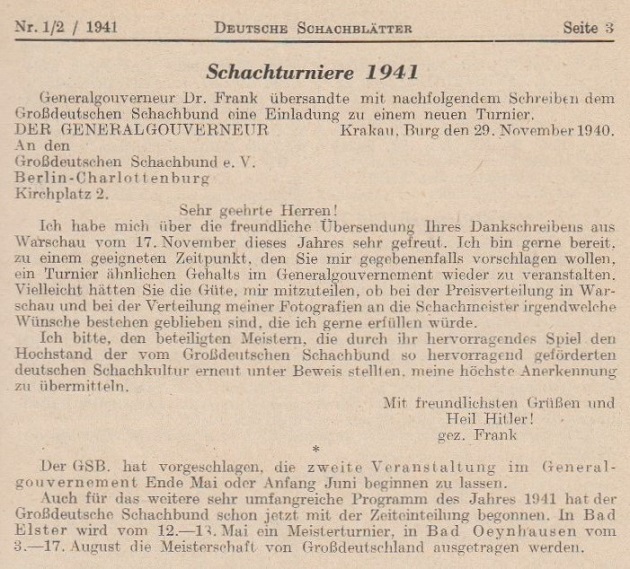 Further information would be welcome. 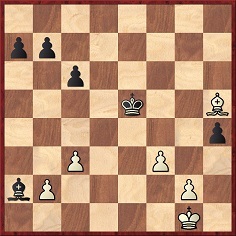 10 h4 Bb7 11 Ndf3 c4 12 Bh7+ Kh8 13 g3 Ne4 14 Qh2 b5 15 Bxe4 dxe4 16 Ng1 b4 17 Ne2 a5 Adjourned. 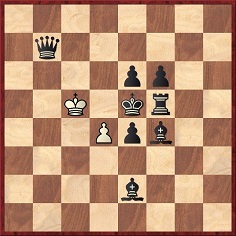 Whether the game was ever resumed has not been ascertained. 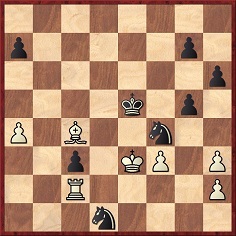 28 Bf1 Rh1+ 29 Kg2 R8h2+ 30 Kg3 Bh4+ 31 Kg4 Rg1+ 32 Kf3 Rg3 mate. 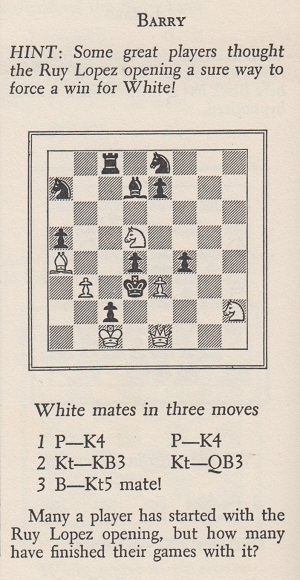 The problem can be found, without a source, on page 179 of The Fireside Book of Chess by I. Chernev and F. Reinfeld (New York, 1949). 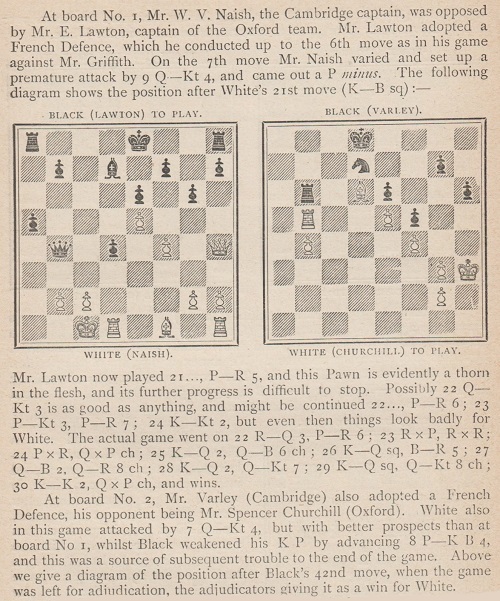 The Tatler and Bystander, 24 October 1945, page 98. 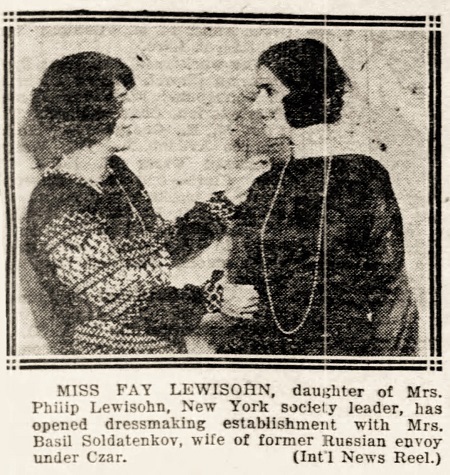 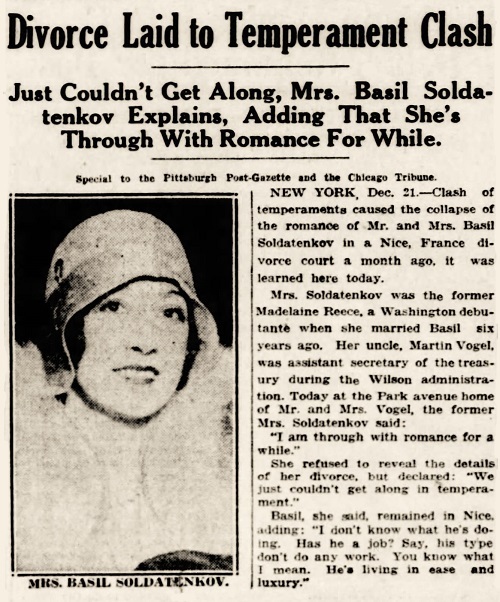 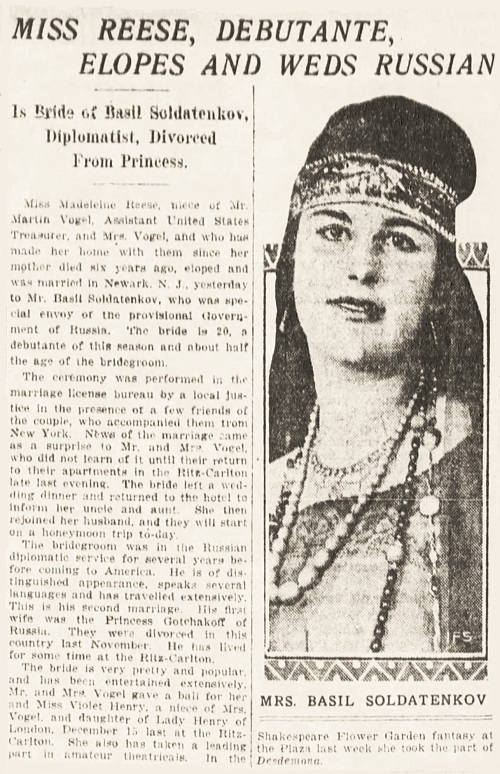 Pittsburgh Post-Gazette, 22 December 1928, page 1. 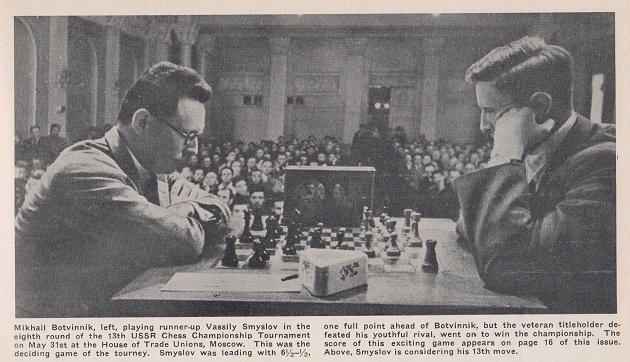 In this position from the game between Smyslov and Botvinnik in the 1944 USSR championship in Moscow, Botvinnik played 35...a5, and White resigned at move 41. 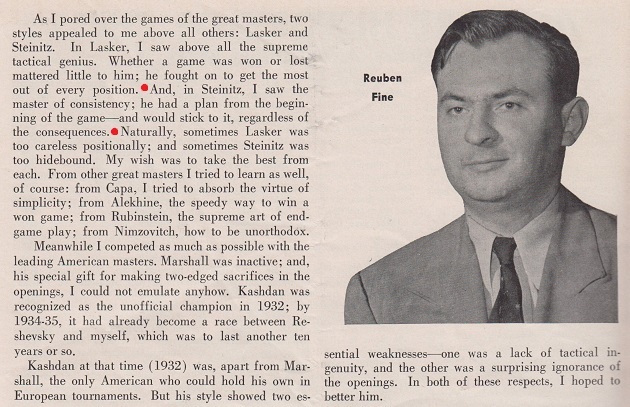 Fine gave due credit to Bromberg on page 109 of Chess Marches On! 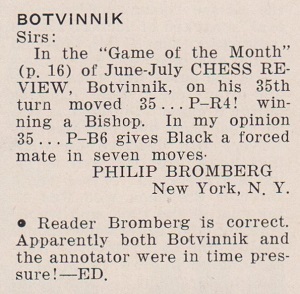 (New York, 1945), and Bromberg was even acknowledged for the discovery on page 403 of the first ‘Chess Stars’ volume on Botvinnik (Sofia, 2000). 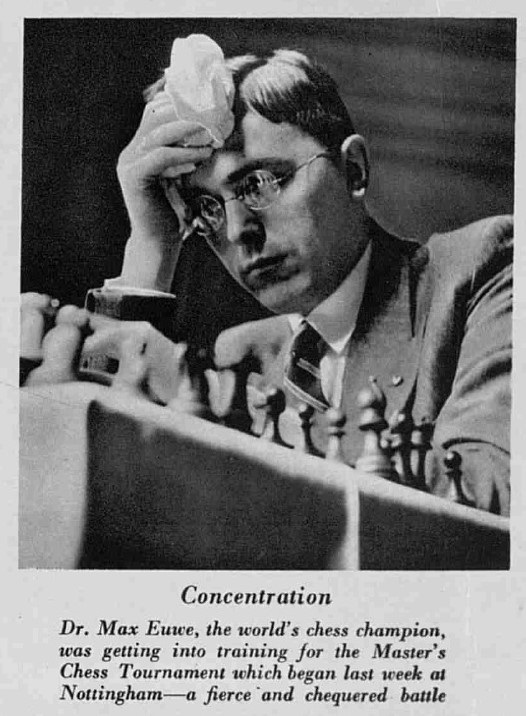 Not all writers have shown care, and on page 144 of Mikhail Botvinnik (Jefferson, 2014) Andrew Soltis awarded an exclamation mark to 35...a5. 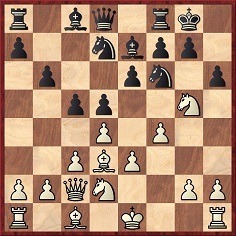 In the first note Botvinnik stated that 35...c3 was also possible and that there was more than one solution to the problem, and in the second he remarked that there were also other ways to win, such as 35...c3. 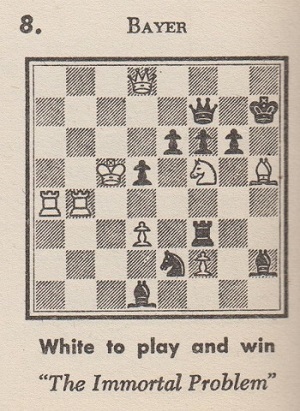 Source: BCM, May 1950, page 152. 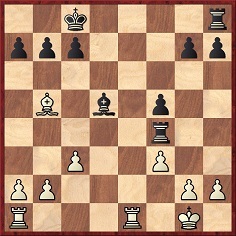 38...d2 39 Rxc2 d1(N) mate. 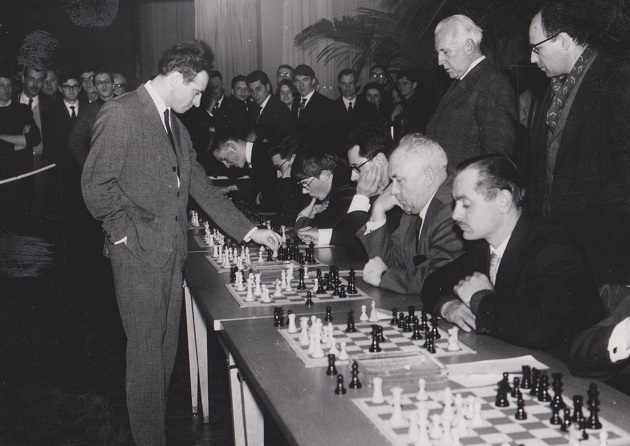 Juan Sebastián Morgado (Buenos Aires) draws attention to an article ‘El caso Raud’ (part one; part two) which he has contributed to ChessBase. 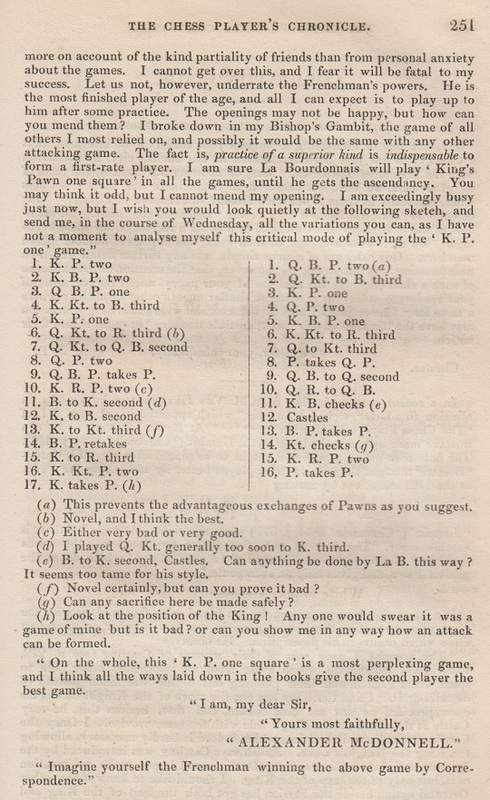 The players’ colours were reversed, for the reason given by Thomas in his Introduction (page ix) and quoted in C.N. 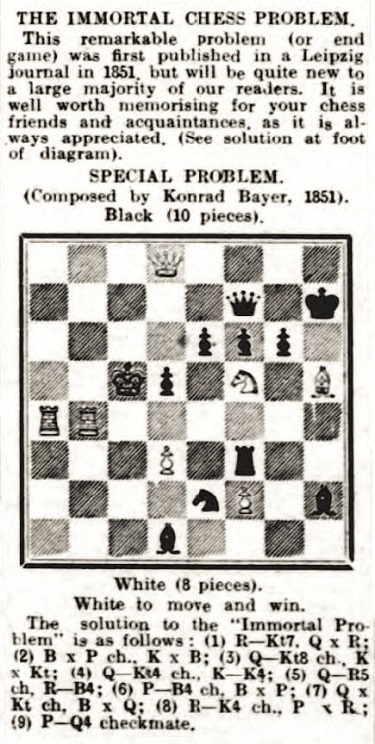 8977. 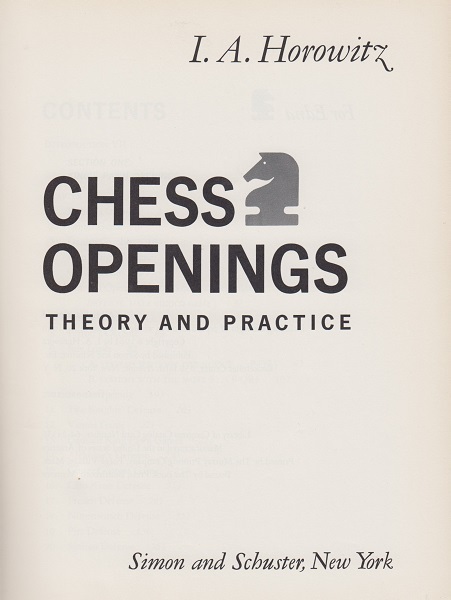 In the light of the references to Horowitz in The Horowitz-Wellmuth Affair and Chess and Ghostwriting, Sean Robinson (Tacoma, WA, USA) asks what is known about the exact genesis of the 789-page volume Chess Openings Theory and Practice by I.A. 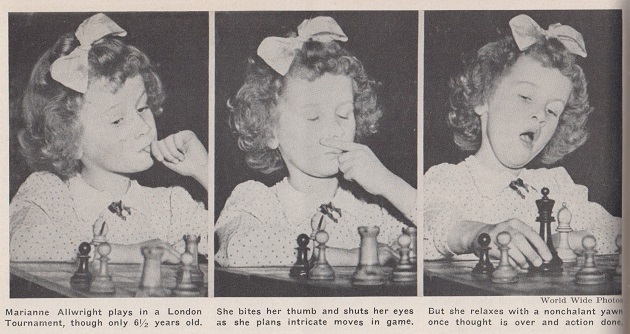 Horowitz (New York, 1964). 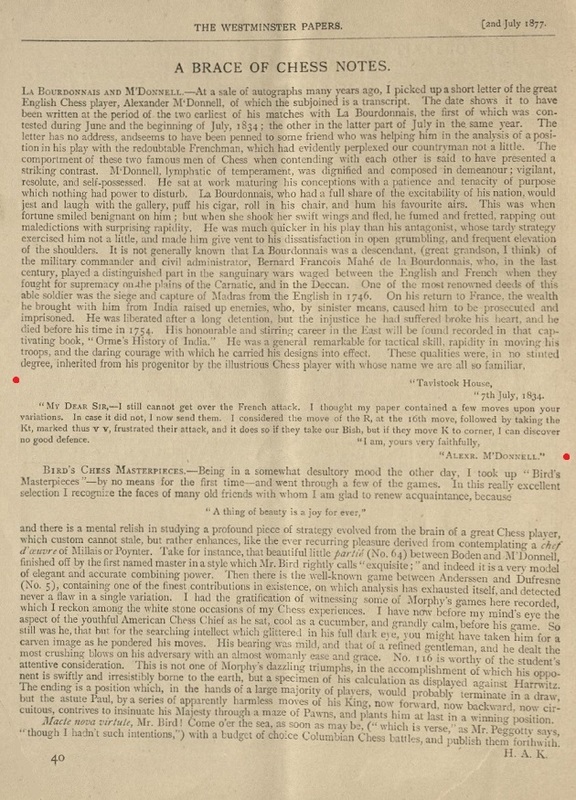 Ivor Goodman (Stevenage, England) points out webpages with information about Edward Algernon Michell and Reginald Pryce Michell. 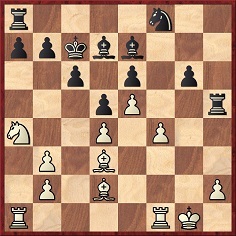 Han Bükülmez (Ecublens, Switzerland) notes a game between Englund and Smith, Hanover Hauptturnier A, 31 July 1902, in which White played not 5 Bxf7+ but 5 Ng5: 1 e4 g6 2 d4 Bg7 3 Nf3 d6 4 Bc4 Nd7 5 Ng5 e6 6 O-O Ne7 7 Bxe6 O-O 8 Bb3 Nc6 9 c3 h6 10 Nf3 Re8 11 Nfd2 Na5 12 Bc2 c5 13 f4 cxd4 14 Nf3 dxc3 15 Nxc3 Nf6 16 Be3 Ng4 17 Bd4 Nc4 18 Nd5 Be6 19 h3 Bxd5 20 hxg4 Bxe4 21 Bxg7 Ne3 22 Qd4 Nxc2 23 Qc3 Rc8 24 White resigns. 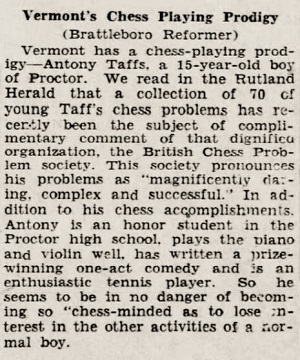 Databases identify Black as Stephen Francis Smith. 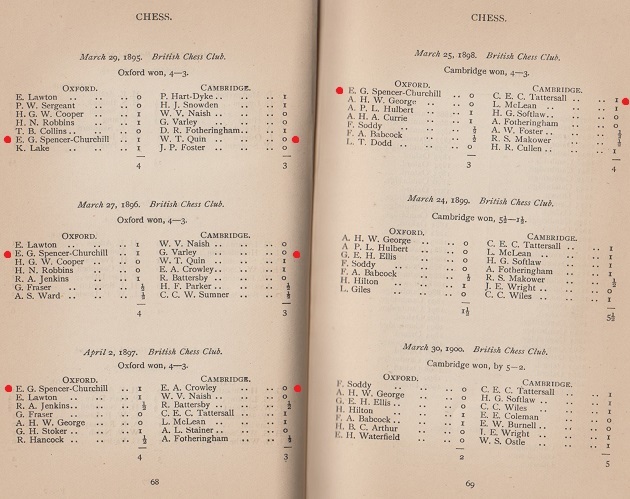 The crosstable on page xxxiii of the tournament book had ‘D. 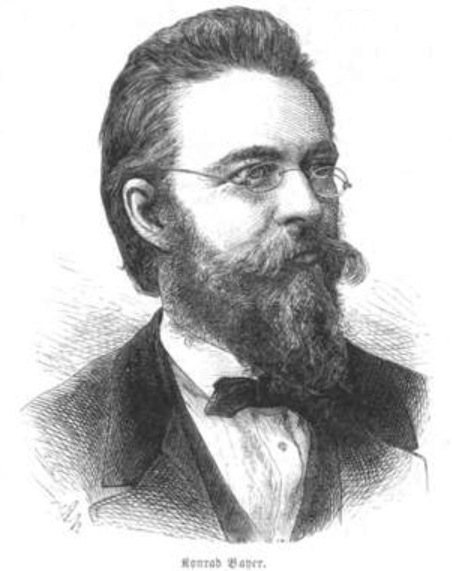 S. Smith – London’, while ‘D. 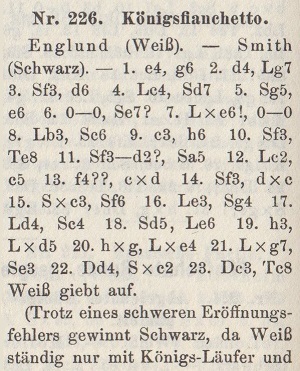 Smith (London)’ was on page 259 of the August 1902 Deutsche Schachzeitung. 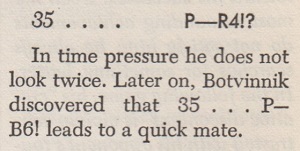 Confusion may have arisen over D./Doctor. 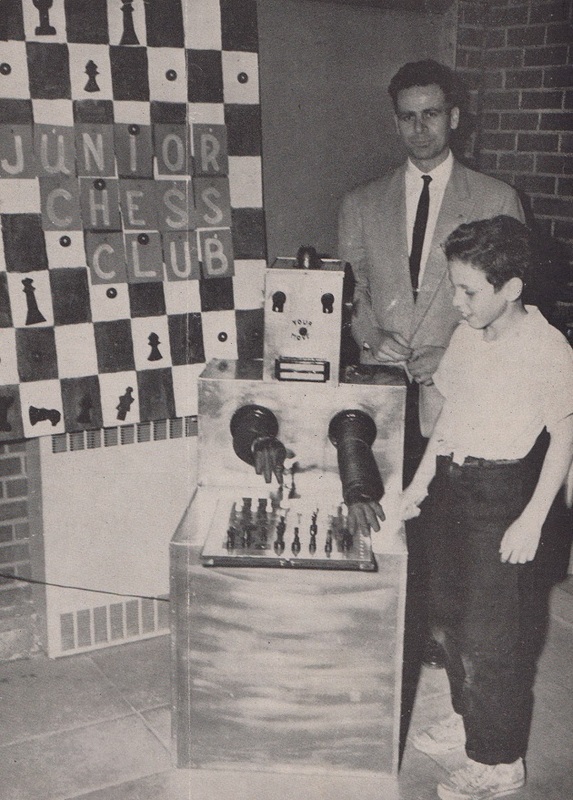 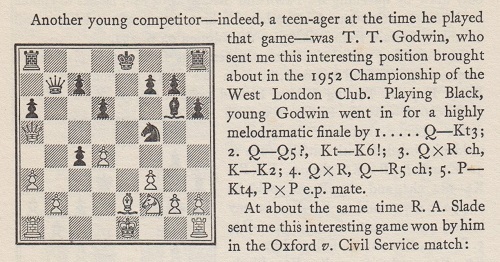 Page 37 of the February 1964 Chess Review mentioned ‘Greg Grant, 16-year-old senior at Jamesvill-De Witt [sic] High’. 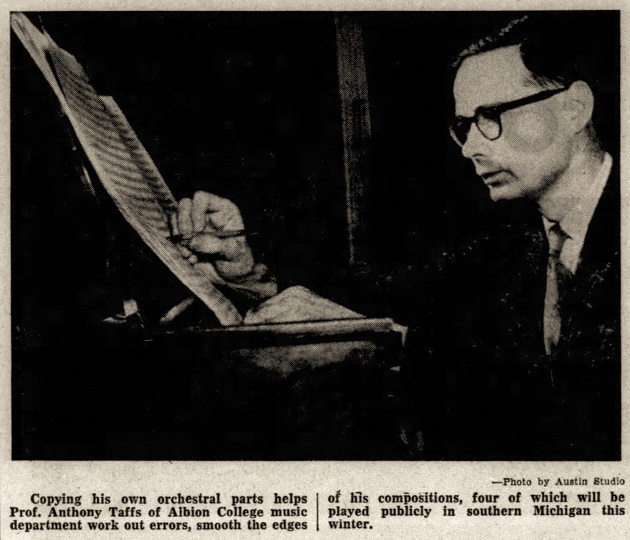 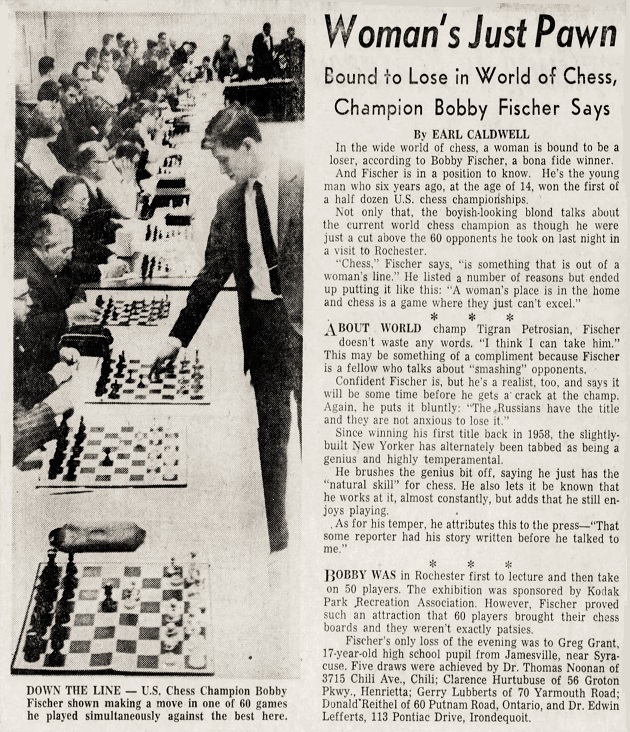 The game against Grant was Fischer’s only defeat in a large simultaneous display (the overall result of which is debatable) in Rochester, NY on 15 February 1964. 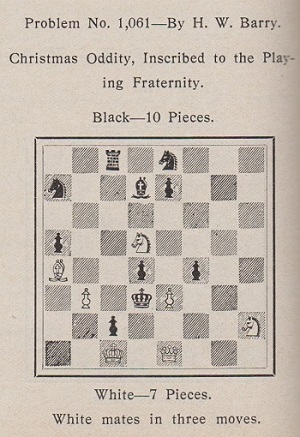 It was published on page 13 of A Legend On The Road by John Donaldson (Seattle, 1994) and on pages 20-21 of the second edition (Milford, 2005). 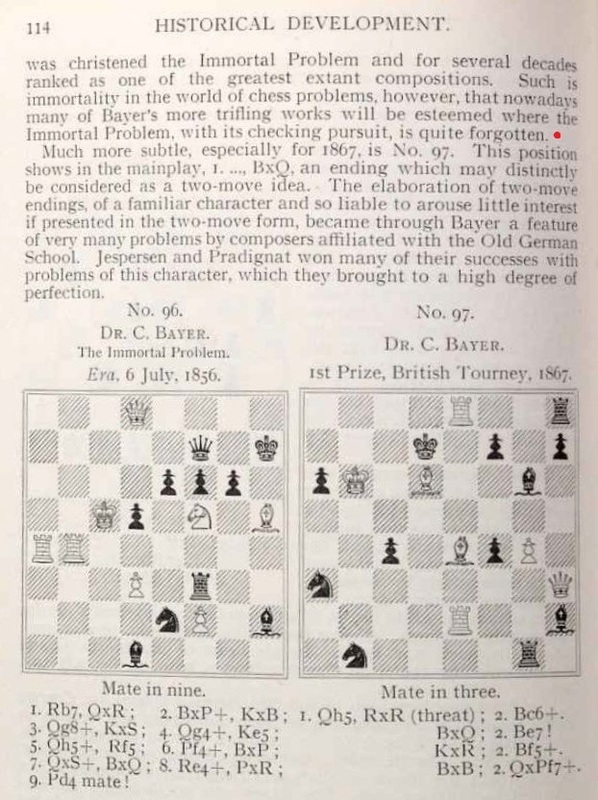 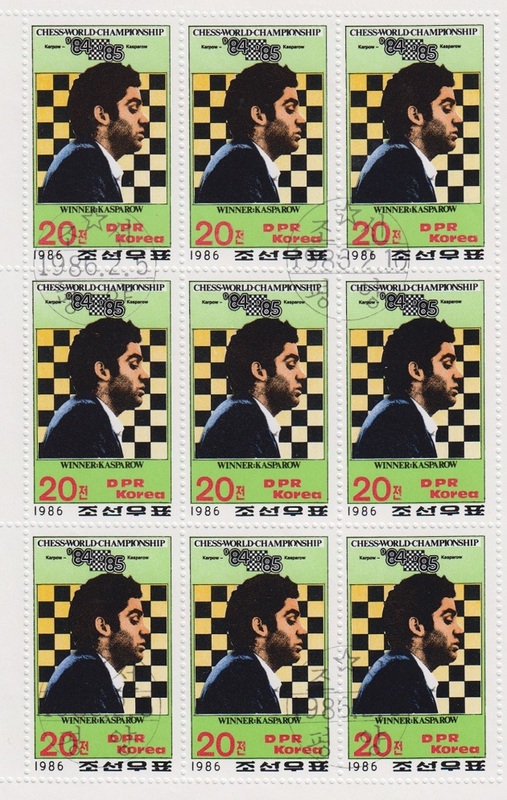 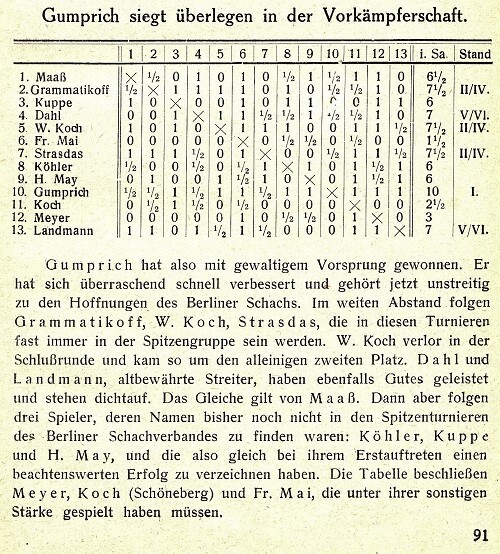 The source of the game-score was ‘Robert Nasiff’s monograph on Syracuse chess history’, and Fischer’s 20th and 30th moves received double question marks. 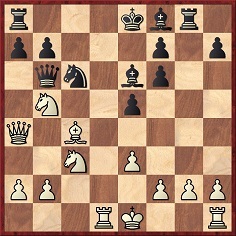 1 e4 e6 2 d4 d5 3 Nc3 Nf6 4 Bg5 dxe4 5 Nxe4 Be7 6 Bxf6 Bxf6 7 Nf3 Bd7 8 c3 Bc6 9 Qc2 g6 10 O-O-O Nd7 11 h4 Bxe4 12 Qxe4 c6 13 h5 Qc7 14 g4 O-O-O 15 g5 Be7 16 Bc4 Nb6 17 Bb3 Nd5 18 Rdg1 Qf4+ 19 Qxf4 Nxf4 20 Rg4 Nd3+ 21 Kc2 Nxf2 22 Rgg1 Nxh1 23 Rxh1 Bd6 24 Kd3 c5 25 d5 b5 26 Ke4 c4 27 Bc2 Rhe8 28 hxg6 hxg6 29 Rh7 Re7 30 Nd4 f5+ 31 White resigns. 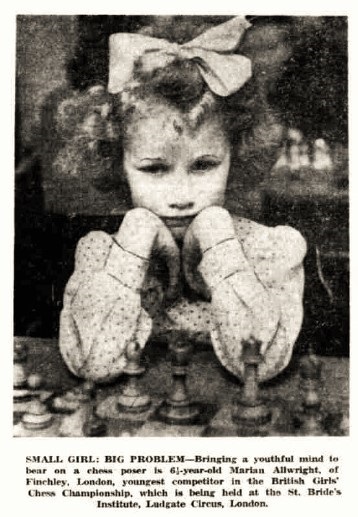 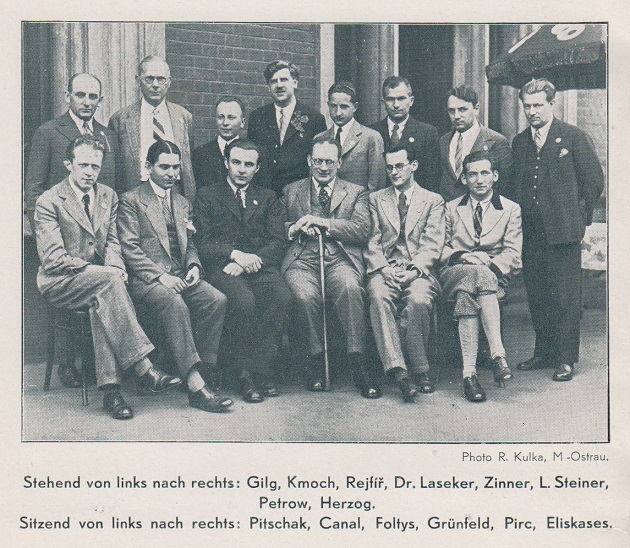 Source: Chess World, 1 March 1946, page 33. 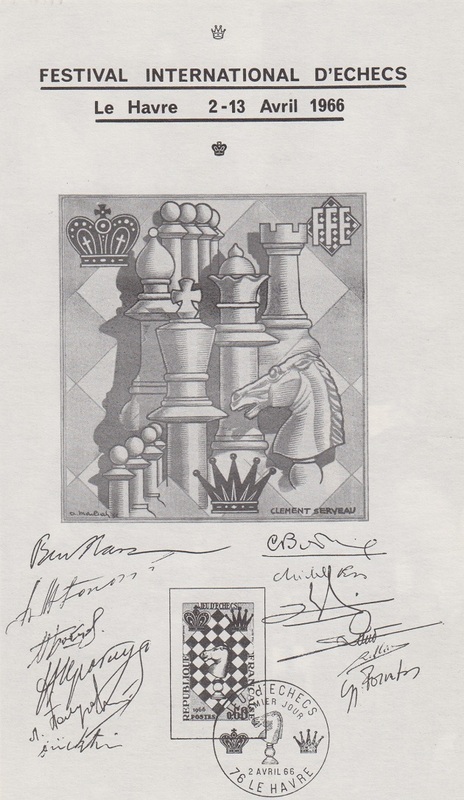 Robert Nasiff (Tully, NY, USA) informs us that his monograph on Syracuse chess history, which was referred to in C.N. 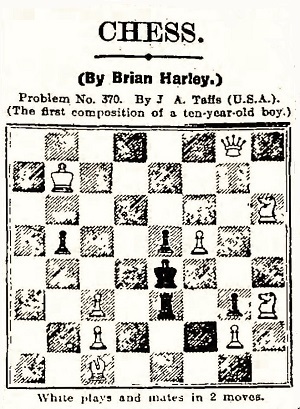 10381, is unpublished and that he had obtained the Fischer v Grant game-score direct from the latter in the second half of the 1960s. The above scan has been provided by the Cleveland Public Library. 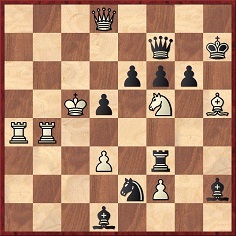 1 d4 Nf6 2 c4 g6 3 Nc3 d5 4 cxd5 Nxd5 5 e4 Nxc3 6 bxc3 c5 7 Bc4 Bg7 8 Ne2 cxd4 9 cxd4 Nc6 10 Be3 O-O 11 O-O Bg4 12 f3 Na5 13 Bxf7+ Rxf7 14 fxg4 Rxf1+ 15 Kxf1 Qd7 16 h3 Qe6 17 Qd3 Qc4 18 Qd2 Qa6 19 Qc2 Nc4 20 Qb3 Kh8 21 Kg1 Nd2 22 Bxd2 Qxe2 23 Be3 Rf8 24 e5 b5 25 Rc1 a5 26 Bg5 h6 27 Bxe7 a4 28 Qd1 Qe3+ 29 Kh1 Rf2 30 Qg1 Qf4 31 a3 Kh7 32 Bc5 h5 33 gxh5 Bh6 34 hxg6+ Kg7 35 Re1 Qg3 36 Bb4 Be3 37 Qh2 Qg5 38 e6 Bf4 39 Qg1 Qh4 40 e7 Rf3 41 Qh2 Resigns. 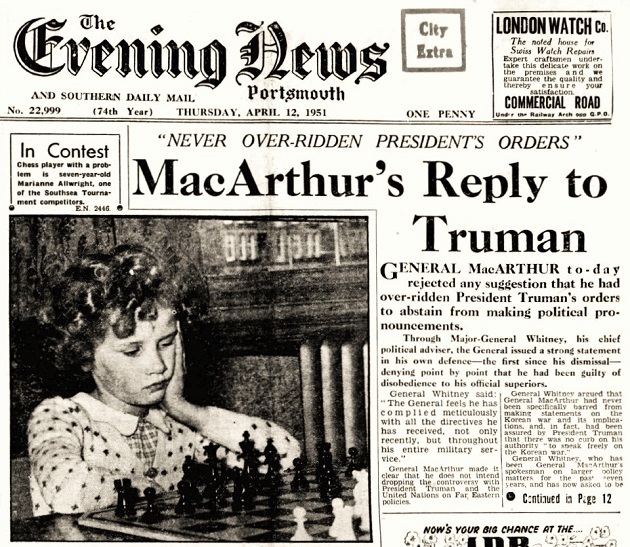 ‘Some 30 readers point out that in No. 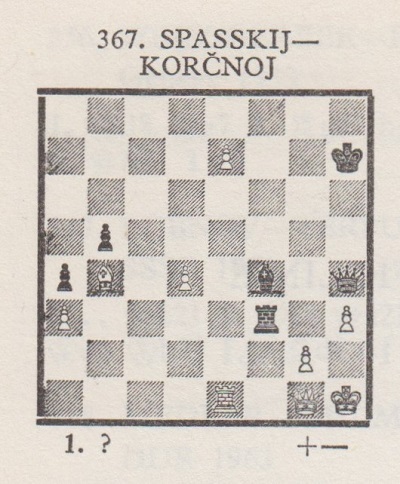 2 of our Winning Practice positions last issue, Korchnoy could have upset Spassky by 1...QxRch 3 [sic] Q-Kt1 RxQch 4 [sic] KxR K-B2 winning the dangerous pawn. 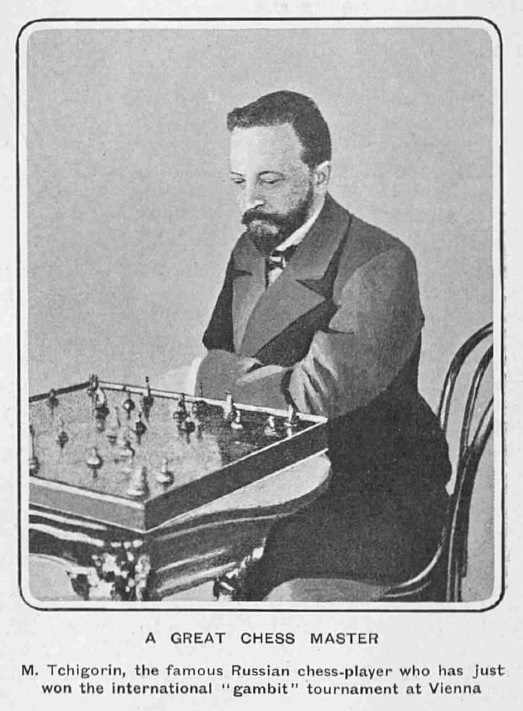 Lev Polugayevsky (above) finished equal second with Krogius in the main tournament, two points behind Larsen. 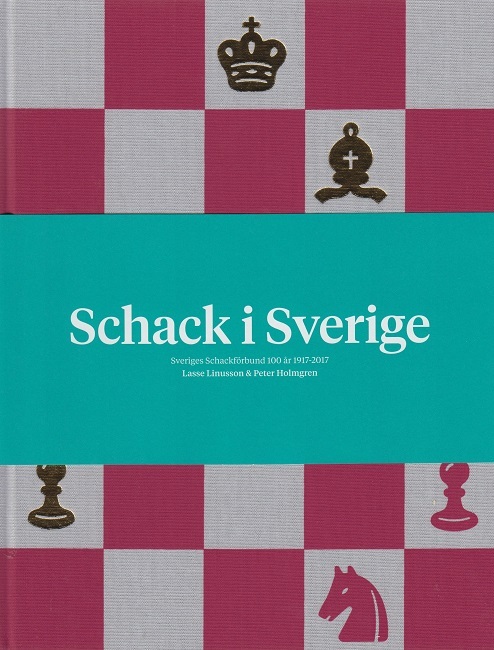 Just received: Schack i Sverige (subtitle: Sveriges Schackförbund 100 år 1917-2017) by Lasse Linusson and Peter Holmgren (Norrköping, 2017), a large-format 496-page hardback available from the Swedish Chess Federation. 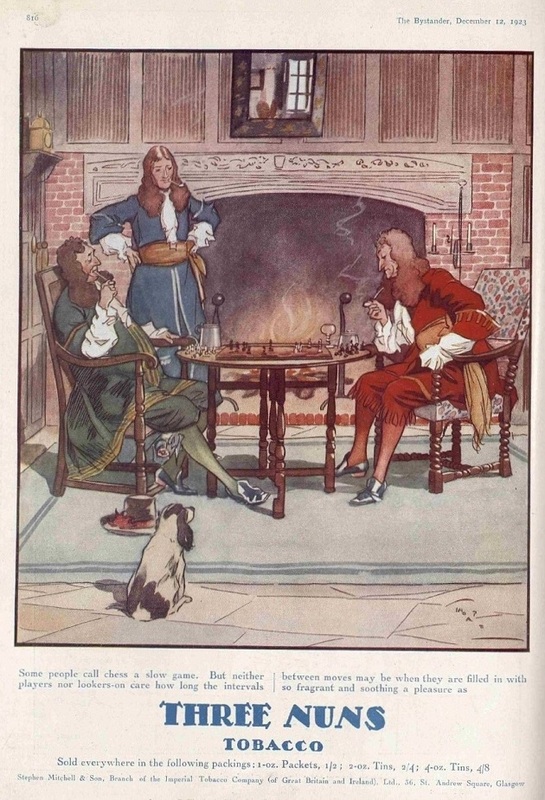 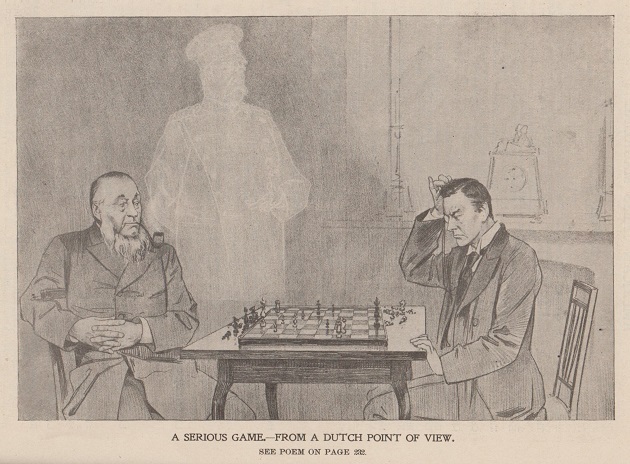 In the cartoon, which concerned the Boer War, the late Otto von Bismarck is standing, and the chess game is between Paul Kruger (the President of the South African Republic) and Joseph Chamberlain (the British Secretary of State for the Colonies). 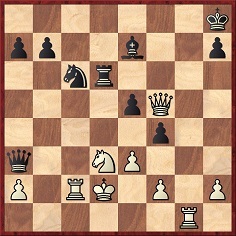 1 e4 e5 2 Nf3 Nc6 3 Bb5 a6 4 Ba4 Nf6 5 O-O d6 6 d4 Bd7 7 Nc3 Ne7 8 dxe5 dxe5 9 Bb3 Ng6 10 Ng5 Be6 11 Nxe6 fxe6 12 Bxe6 c6 13 Qxd8+ Rxd8 14 Be3 Bb4 15 f3 Bxc3 16 bxc3 Rd6 17 Bc8 b5 18 Bxa6 Kf7 19 c4 Rb8 20 Rab1 Rd7 21 cxb5 cxb5 22 Bxb5 Rdb7 23 a4 Ne7 24 Ba7 Rxa7 25 Bc4+ Kg6 26 Rxb8 Rxa4. 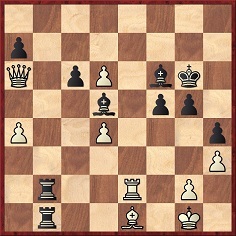 The remaining moves from the Chess Monthly: 27 Bd3 Rd4 28 Rb6 Kf7 29 Rfb1 Nd7 30 R6b4 Rd6 31 Bc4+ Kf6 32 Be2 Ng6 33 Rd1 Ke7 34 Rxd6 Kxd6 35 Bc4 Kc5 36 Rb7 Nf6 37 Bd5 Nh5 38 c4 Resigns. 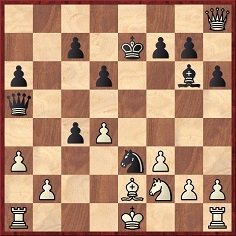 1 e4 e5 2 Nf3 Nf6 3 Nxe5 d6 4 Nf3 Nxe4 5 d4 d5 6 Bd3 Nc6 7 c3 Bg4 8 h3 Bh5 9 Be3 Bd6 10 Nbd2 f5 11 Nb3 Qe7 12 Qe2 f4 13 Bd2 Bxf3 14 gxf3 Nxd2 15 Qxe7+ Nxe7 16 Kxd2 O-O-O 17 Rae1 Rde8 18 Re6 Nc6 19 Rxe8+ Rxe8 20 Bxh7 b6 21 Rg1 Re7 22 Bg8 Nd8 23 Bxd5 c6 24 Be4 Kc7 25 Kd3 Ne6 26 Nd2 c5 27 d5 Nf8 28 Nc4 b5 29 Nxd6 Kxd6 30 b3 Nd7 31 Rg6+ Kc7 32 d6+ Resigns. 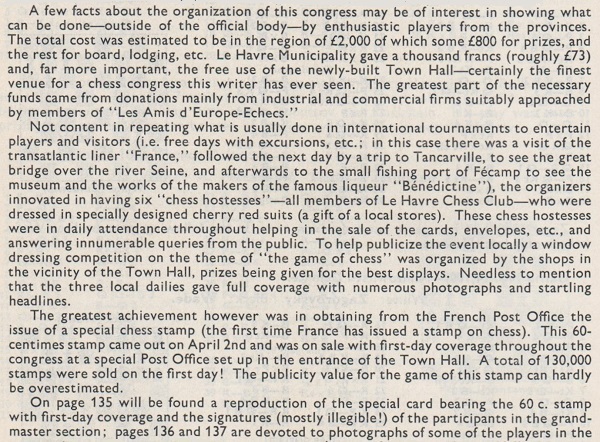 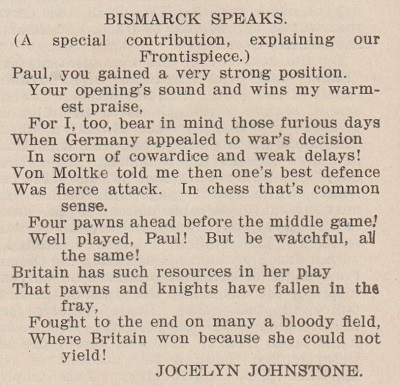 A further, slightly later, source for the game is the Westminster Budget, 16 April 1897, page 28. 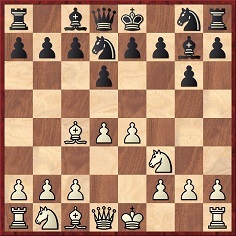 1 e4 e6 2 d4 d5 3 Nc3 Nf6 4 e5 Nfd7 5 f4 c5 6 dxc5 Bxc5 7 Qg4 O-O 8 Bd3 f5 9 Qh3 Nc6 10 Nf3 h6 11 g4 fxg4 12 Qxg4 Qe7 13 Qg6 Rf5 14 Bxf5 exf5 15 Nxd5 Qd8 16 Nf6+ Kf8 17 Nxd7+ Bxd7 18 e6 Bxe6 19 Qxe6 Nd4 20 Nxd4 Qxd4 21 Be3 Qxe3+ 22 Qxe3 Bxe3 23 Rf1 Re8 24 Kd1 Re4 25 c3 Rxf4 26 Ke2 Rxf1 27 Rxf1 f4 28 Kf3 b6 29 Rd1 a5 30 a4 g5 31 b4 h5 32 h3 axb4 33 cxb4 Ke7 34 Rd5 Kf6 35 a5 bxa5 36 bxa5 Ba7 37 a6 g4+ 38 hxg4 hxg4+ 39 Kxf4 Ke6 40 Rd1 ‘and after a few more moves Black resigned’. 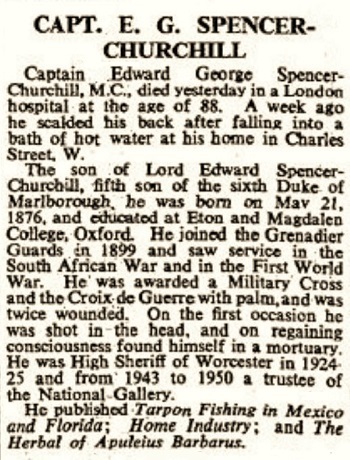 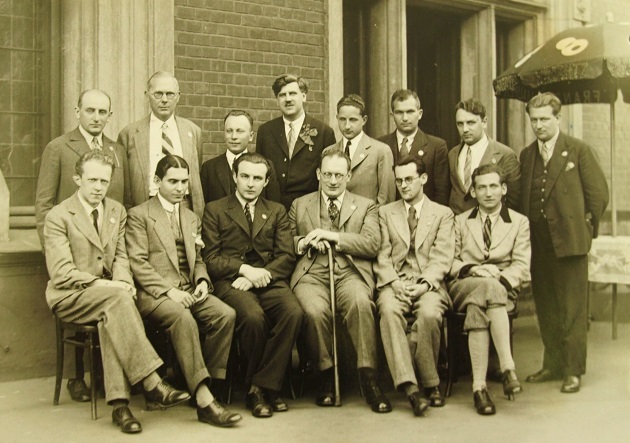 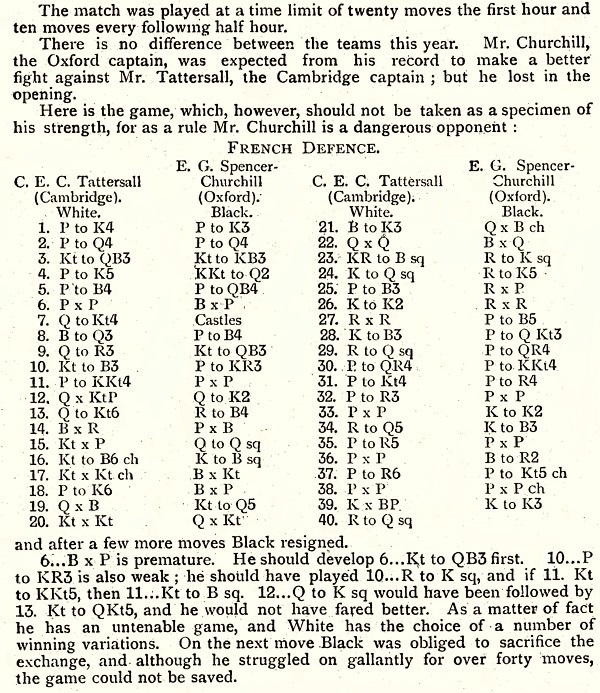 Other games played by Spencer-Churchill at Oxford University include a draw against A. Hirsch and a victory over E.R. 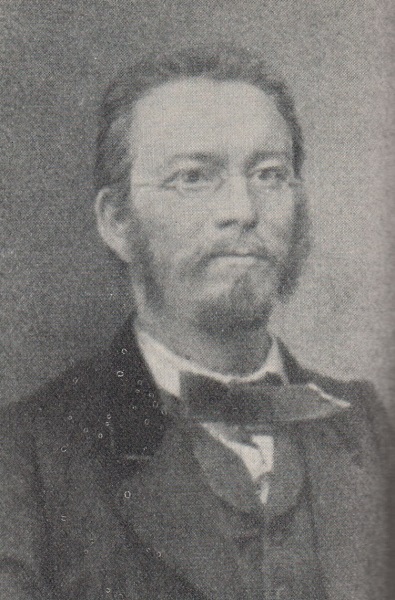 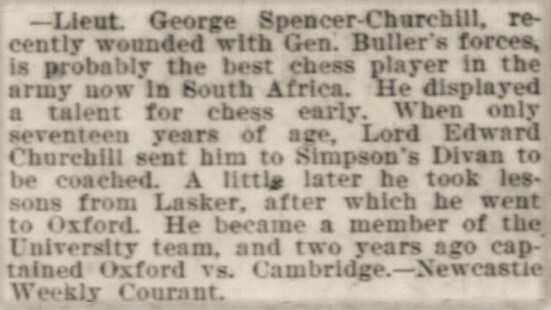 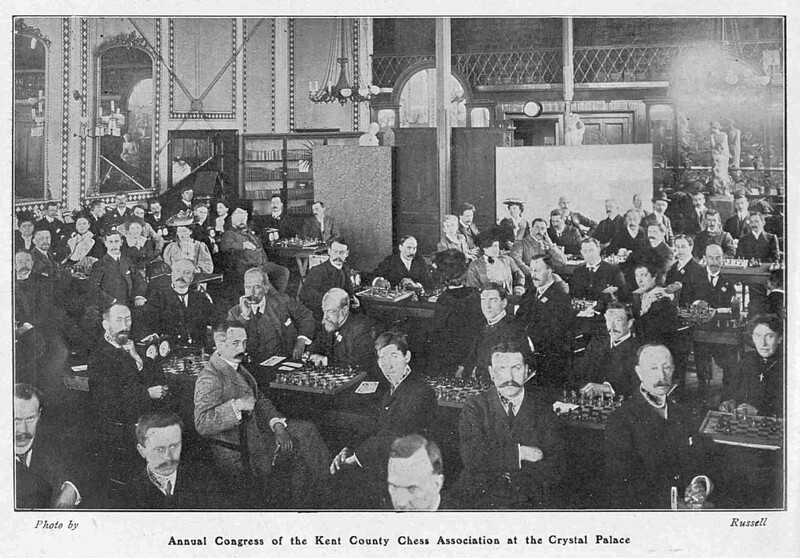 Turner (mentioned on pages 229-230 of the April 1896 Chess Monthly). 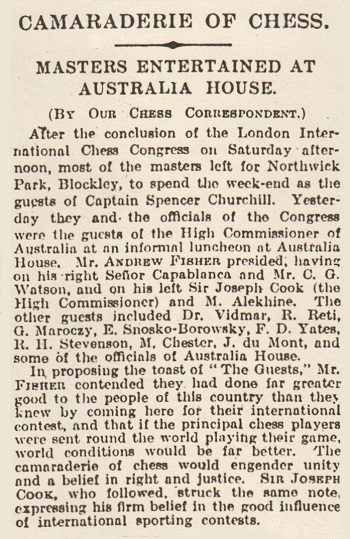 The same newspaper (23 October 1922 edition, page 7) recorded that at a 33-board simultaneous exhibition given by Capablanca against the Maccabean Society at the Hotel Cecil in London the previous day, E.G. 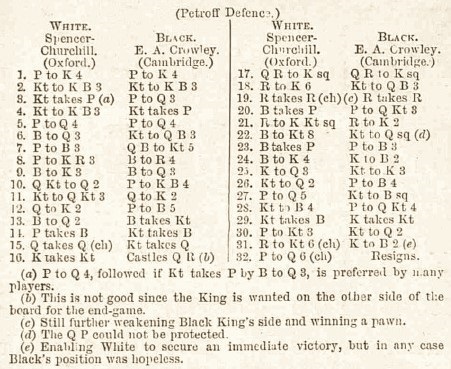 Spencer-Churchill was one of four players who drew. 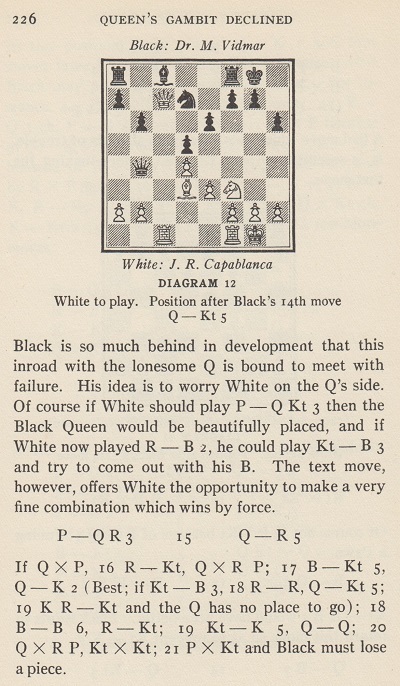 The full article was reproduced on pages 18-23 of Fine’s book Lessons from My Games (New York, 1958). 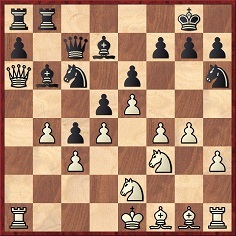 The moves discussed: 1 e4 c5 2 f4 Nc6 3 c3 e6 4 Nf3 d5 5 e5 f6 6 Na3 Nh6 7 Nc2 Qb6 8 d4 cxd4 9 cxd4 Bd7 10 h4 Rc8 11 Be2 Bb4+ 12 Kf2 O-O 13 Kg3 fxe5 14 fxe5 Nf5+ 15 Kh3 h5 16 g4 hxg4+ 17 Kxg4. 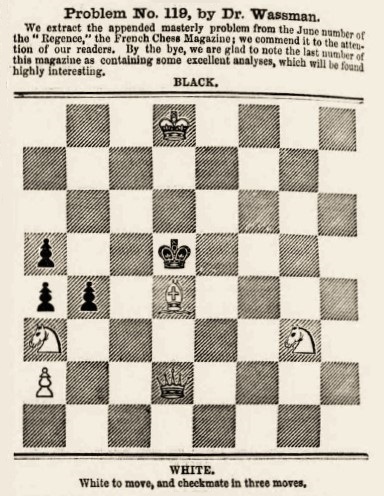 Page 245 of Amusements in Chess by Charles Tomlinson (London, 1845) stated that the recipient of the letter was ‘Mr Walker’. 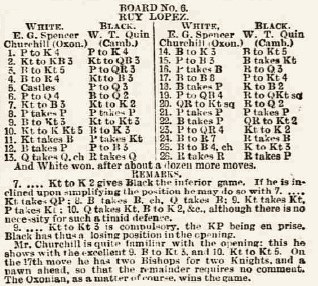 The newspaper then gave a detailed report, without games, of Blackburne’s 28-board simultaneous display in Derby the previous week (24 November 1887). 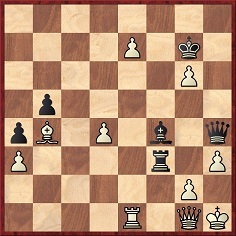 31...Rxd3+ 32 Qxd3 Bb4+ 33 Rc3 Qb2+ 34 Qc2 Bxc3+ and Black won. 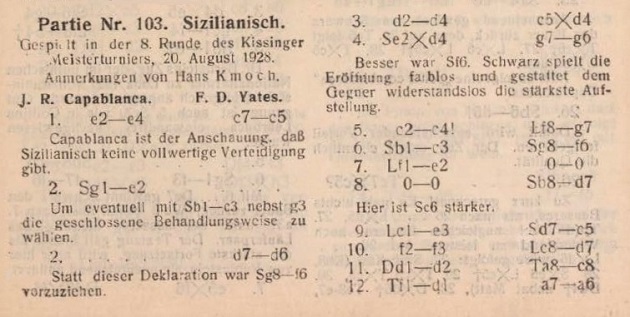 Source: Neue Hamburger Zeitung, 20 September 1896, page 10. 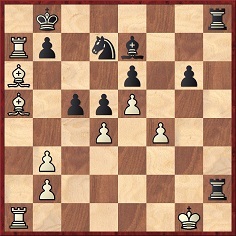 40...Rxe1+ 41 Rxe1 Bxd4+ 42 White resigns. 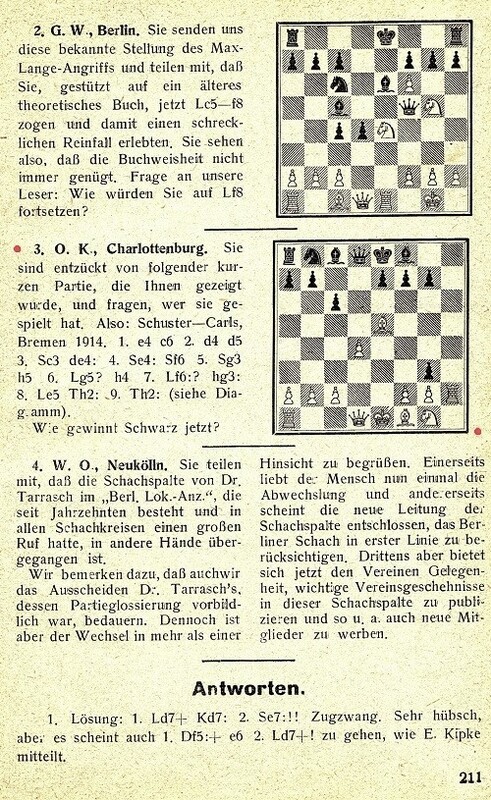 Source: Neue Hamburger Zeitung, 13 September 1896, page 10. 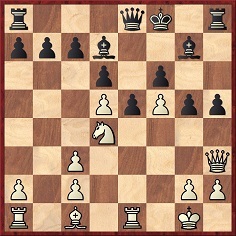 38...h6 39 Nxe6 Kxe6 40 Nf4+ Kf7 41 e6+ Ke7 42 Nxd5+ Kxe6 43 Bxc4 Qxc4 44 Ne3 Qd3 45 d5+ Kf7 46 Rxc2 Na5 47 Ra2 Ne7 48 White resigns. 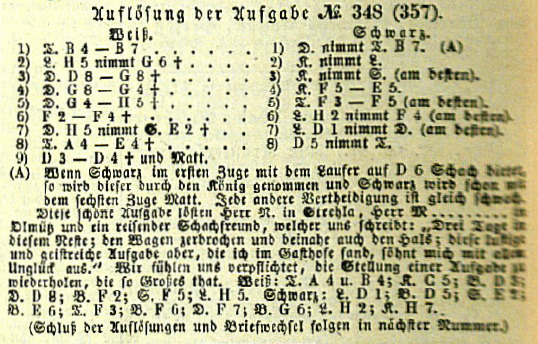 Sources: Neue Hamburger Zeitung, 6 February 1904, page 18, and Hamburger Nachrichten, 7 February 1904, page 28. 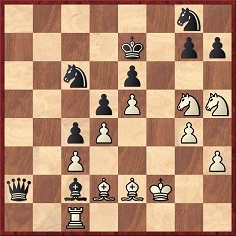 29...Kf4 30 Kf2 a5 31 Bg6 Bc4 32 Be4 Bd5 33 Bc2 b6 34 Bd3 c5 35 Bc2 b5 36 Ke2 Kg3 37 Kf1 c4 38 Kg1 b4 39 cxb4 axb4 40 Kf1 c3 41 bxc3 bxc3 42 Kg1 Ba2 43 Kf1 Bc4+ 44 Kg1 Bb5 45 Kh1 Bf1 46 Kg1 Bxg2 47 f4 h3 48 f5 h2 mate. 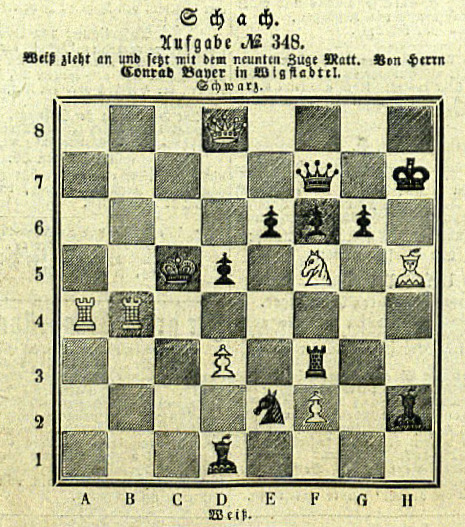 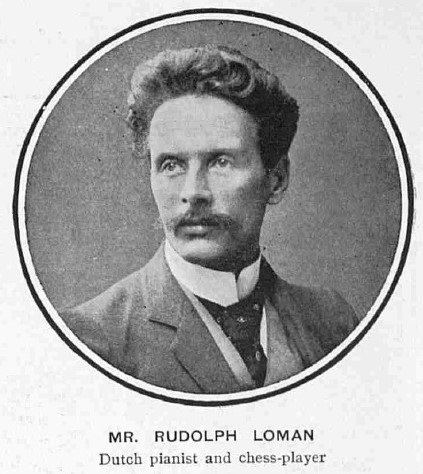 Source: Hamburger Nachrichten, 7 February 1904, page 28. 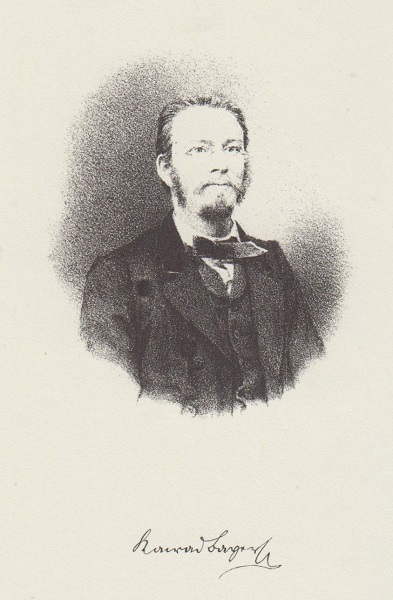 The problem’s publication on page 192 of the 15 June 1856 issue of La Régence can be viewed on-line, and it will be noted that the composer was identified as M. [Monsieur] Wassmann. 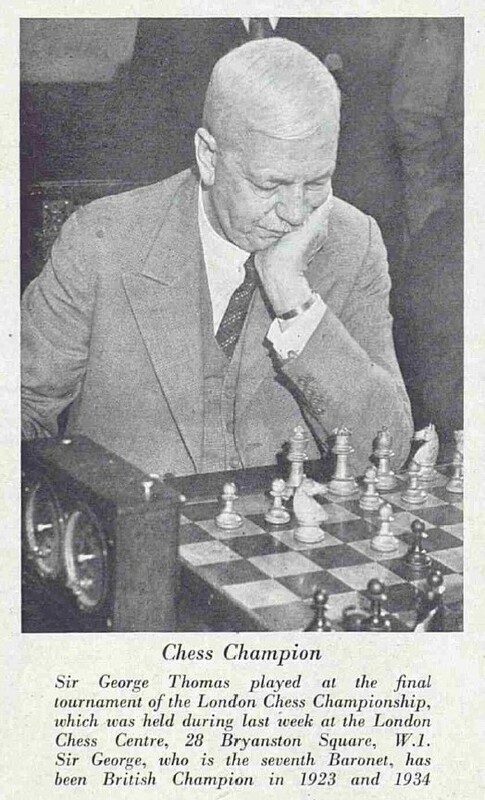 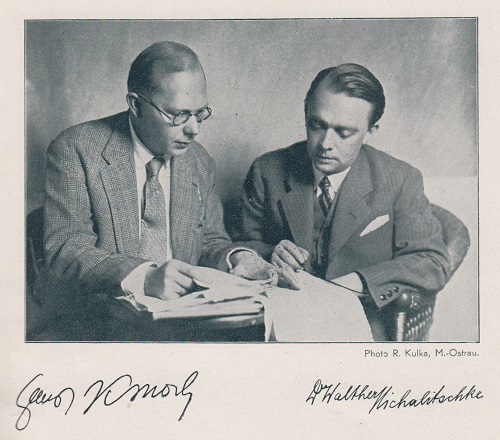 See Steinitz Stuck and Capa Caught for the story of Morphy requiring over an hour to solve the problem and Alekhine finding the solution immediately. 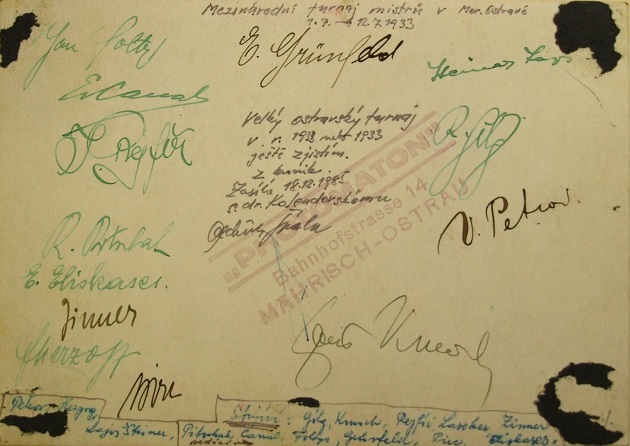 We believe that the photograph was taken in Budapest, and details about the exact occasion are sought. 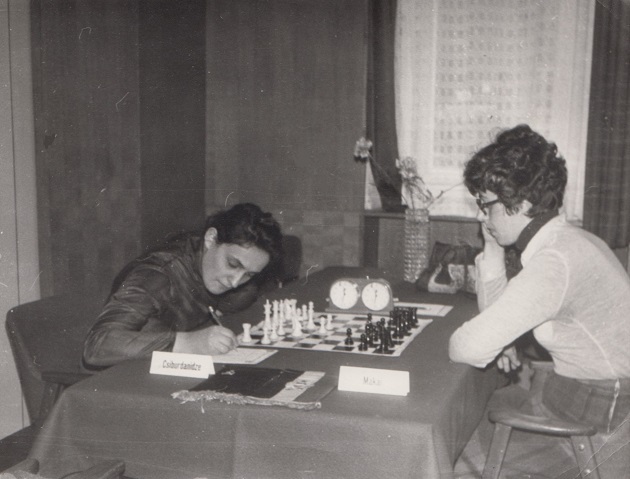 Suzana Makai (1945-87) was born in Romania but in the latter part of her life was resident in Hungary. 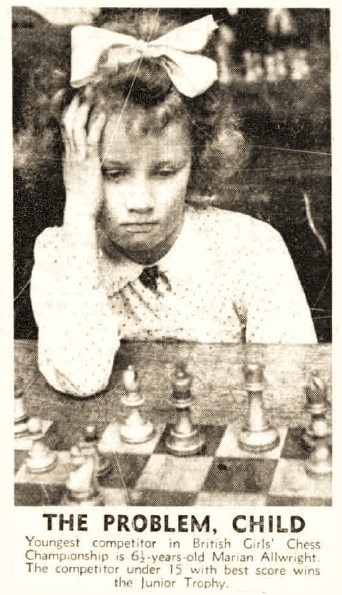 A brief notice of her death is on page 24 of Europe Echecs, July-August 1987. 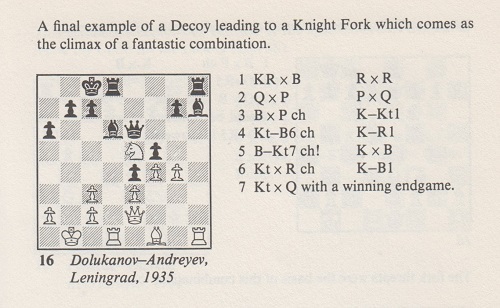 Can any other chess composition be found whose solution corresponds to the moves of an opening?